Most people fully recover from minor corneal abrasions without permanent eye damage. However, deeper scratches can lead to corneal infections, corneal erosion, or scarring of the cornea. If not treated properly, these complications can result in long-term vision problems. Any unusual symptoms, including a recurrence of pain following healing, should be reported to your eye doctor. Corneal abrasion is probably the most common eye injury and perhaps one of the most neglected. It occurs because of a disruption in the integrity of the corneal epithelium or because the corneal surface is scraped away or denuded as a result of physical external forces. Corneal epithelial abrasions can be small or large (see the images below). Corneal abrasions usually heal rapidly, without serious sequelae. Consequently, they are often considered of little consequence. However, deeper corneal involvement, infection, or poor healing may result in irregularity of the corneal epithelium or scar formation within the stroma. Corneal abrasions occur in any situation that causes epithelial compromise. Examples include corneal or epithelial disease (eg, dry eye), superficial corneal injury or ocular injuries (eg, those due to foreign bodies), exposure to ultraviolet light, and contact lens wear (eg, daily disposable soft lenses, extended-wear soft lenses, gas-permeable lenses, hard polymethylmethacrylate lenses). Spontaneous corneal abrasions may be associated with map-dot-fingerprint dystrophy or recurrent corneal erosion syndrome. Foreign body–related abrasions are defects in the corneal epithelium that result from removal or spontaneous dislodgement of a corneal foreign body. Foreign body abrasions are typically caused by pieces of metal, wood, glass, plastic, fiberglass, or vegetable material that have become embedded in the cornea or adherent to the inner surface of the upper lid. Contact lens–related abrasions are defects in the corneal epithelium that are left behind after the removal of an over worn, improperly fitting, or improperly cleaned contact lens. In these cases, the mechanical insult is not from external trauma but rather from a foreign body that may be associated with specific pathogens. Spontaneous defects in the corneal epithelium may occur with no immediate antecedent injury or foreign body. Eyes that have suffered a previous traumatic abrasion or eyes that have an underlying abnormality of the corneal epithelium are prone to this problem. For patient education information, see the Eye and Vision Center, as well as Corneal Abrasion; Foreign Body, Eye; and Eye Injuries. The cornea is a transparent tissue over the anterior part of the eye that serves several purposes: protection, refraction, and filtration of some ultraviolet light. It has no blood vessels and receives nutrients through tears as well as from the aqueous humor. It has sensory innervation from the ophthalmic division of the trigeminal nerve. A corneal abrasion is a defect in the surface of the cornea that is limited to the most superficial layer, the epithelium, and does not penetrate the Bowman membrane. In some cases, the bulbar conjunctiva is also involved. Corneal abrasions result from physical or chemical trauma. Severe corneal injuries can also involve the deeper, thicker stromal layer; in this situation, the term partial-thickness corneal laceration may be used. The conjunctival response to corneal wounding has been known since 1944, when Mann first observed that peripheral corneal abrasions heal by the sliding of limbal cells to cover the epithelial defect. This response is split into 2 phases: (1) the response of the limbal epithelium, which is the source of the new corneal epithelial stem cells, and (2) the response of the conjunctival epithelium itself. Under normal circumstances, the limbal epithelium acts as a barrier and exerts an inhibitory growth pressure that prevents the migration of conjunctival epithelial cells onto the cornea. Like the rest of the surface of the body, the conjunctiva and the cornea are in a constant state of turnover. Corneal epithelial cells are continuously shed into the tear pool, and they are simultaneously replenished by cells moving centrally from the limbus and anteriorly from the basal layer of the epithelium. Movement from the basal to superficial layers is relatively rapid, requiring 7-10 days. However, movement from the limbus to the center of the cornea is slow and may require months. This normal physiologic process is exaggerated in the case of a corneal abrasion. During corneal healing of a lesion, corneal epithelial cells become flattened, they spread, and they move across the defect until they cover it completely. Cellular proliferation, which is independent of cell migration, begins approximately 24 hours after injury. Stem cells from the limbus also respond by proliferating to give rise to daughter cells called transient amplifying cells. These cells migrate to heal the corneal defect and proliferate to replenish the wounded area. The observation of limbal pigment migrating onto the clear cornea provides additional evidence of this process. Demonstration of the centripetal migration of limbal cells (marked by India ink) provided more direct evidence of this concept. These cells migrate in masses as a continuous, coherent sheet, with most cells retaining their positions relative to each other, much like the movement of a herd of cattle. Rearrangement of intracellular actin filaments plays a role in movement. Cell migration can be inhibited by blocking polymerization of actin, indicating that actin filaments actively participate in the mechanism of cell motion. Some authors believe that conjunctival and limbal epithelial cells may contribute to the regeneration of corneal epithelium. Marked proliferative responses in the conjunctiva after a central corneal epithelium abrasion have been described. Why the conjunctival epithelium should proliferate in response to a central corneal wound is unknown. One possibility is that the proliferation replenishes the number of goblet cells, which decreases by up to 50% after corneal wounding. However, proliferation occurs at high levels in the bulbar conjunctiva, which contains few if any goblet cells. The apparent decrease in cell number is more likely the result of mucin secretion rather than the actual loss of goblet cells. Alternatively, conjunctival cells may migrate into the limbus or cornea to help replenish the wound area. No firm data suggest that conjunctival epithelium migrates onto the corneal surface in the presence of intact limbal epithelium. Lastly, healing of the corneal epithelial wound is not complete until the newly regenerated epithelium has firmly anchored itself to the underlying Bowman membrane. Permanent anchoring units are not formed until the wound defect is covered completely. Epithelial cells migrate rapidly and develop strong, permanent adhesions within 1 week when the basement membrane is regularly formed and released during the cell migration process. Although transient attachments are regularly formed and released during the cell migration process, formation of normal adhesions takes 6 weeks, according to Dua et al. Tiny buds of corneal epithelium are present along the contact line between the normal corneal epithelium and the migrating conjunctival epithelium. These buds arise from the corneal epithelium, and normal corneal epithelium appears to replace the conjunctival epithelium by gradually pushing it toward the limbus. The magnitude and extent of both the conjunctival and corneal regenerative responses to a corneal abrasion correlate with the size of the wound. Large epithelial defects were reported to induce a pronounced response in the rate of epithelial cell migration and mitosis at the limbus. Insults caused by chemical injuries, Stevens-Johnson syndrome, and contact lens–induced keratopathy may result in limbal damage. These insults cause delayed healing of the cornea, recurrent epithelial erosions, corneal vascularization, and conjunctival epithelial ingrowth. Defects in the epithelium need not be full thickness. Overnight wearing of soft lenses, which do not provide sufficient oxygen transmissibility to prevent hypoxia, causes superficial desquamation of epithelium and increases the propensity for abrasions and infections. Corneal swelling induced by overnight wearing of contact lenses is the most important factor. The cornea normally swells 2-4% during sleep owing to hypotonicity of the nocturnal tear film. With a contact lens in place, overnight swelling increases to an average of 15%, and gross stromal edema can be present on awakening. In some patients, induced corneal swelling can be sufficient to cause corneal bullae, which may rupture, leading to epithelial defects. In persons with trachoma, the constant corneal trauma by aberrant lashes and inadequate tears can produce corneal erosions, ulceration, and scarring. These constitute the major pathway to blindness in trachoma. 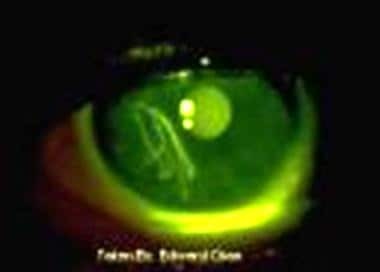 Contact lens–induced epithelial defects or direct trauma during lens insertion or removal can cause corneal abrasions. Abrasions occur more frequently with rigid lenses than with other lenses, possibly because of their small diameter and the sharp corneal defects they cause. Rigid contact lenses can lead to relative corneal hypoxia, epithelial edema, and epithelial breakdown. Corneal abrasions due to soft lenses are observed most frequently with tight or extended-wear lenses. In these situations, acute epithelial hypoxia impairs attachment of the epithelium to the Bowman membrane. The most common trauma is an inferior abrasion of the cornea caused by lens removal. Sometimes, the person's fingernail slices the contact lens and also the cornea. More often, the lens becomes slightly dehydrated at the end of the day because of insufficient blinking. The lens adheres to the cornea, removing the epithelium. This area may not heal well, especially if the epithelial cells are continually torn away. After the contact lens is removed, the patient may feel discomfort; however, no pain occurs when the lens is worn because it acts as a bandage. Patients who incompletely blink and those who work in a dry environment, read most of the day, or look at TV or computer screens should be warned about this complication. A foreign body may become trapped under a contact lens and produce linear scratch marks on the cornea. The total irregularity of these wavy abrasions is the clue to this cause of injury. A soft lens offers no protection against blunt trauma to the eye, but it does not pose any additional jeopardy in terms of eye trauma. For example, a soft lens does not adversely affect an eye injured by a fist or a ball. In industrial settings, a soft lens is not a substitute for safety glasses. Rigid contact lenses may break or chip, causing punctate epithelial keratopathy. Adverse corneal events, such as corneal abrasions, have been reported with techniques of overnight corneal reshaping with orthokeratology. Lang concluded that corneal compromise and poor compliance can cause adverse events with corneal reshaping. The need for ongoing patient education is important in both children and adults who wear contact lenses. Corneal abrasions can occur in almost all sports. They most frequently occur in young people. Approximately 1 in 10 college basketball players has an eye injury each year. Most basketball-related eye injuries are corneal abrasions caused by an opponent's finger or elbow striking the player's eye. Although significant eye injuries are not a major risk in equestrian events other than polo, cross-country riders frequently have corneal abrasions from hitting tree branches overhanging the trail. Wearing spectacles with polycarbonate lenses provides adequate protection against this risk. Although cross-country skiing causes fewer musculoskeletal injuries than alpine skiing, cross-country skiers are more likely than alpine skiers to have eye injuries, especially corneal abrasions from contact with tree twigs. In addition, both cross-country and downhill skiers can have solar keratopathy (snow blindness) and injuries due to accidents with ski poles. In patients undergoing eyelid surgery, corneal abrasion can result from sutures inadvertently placed through the tarsus or conjunctival surface. After sutures are placed, the lid should be everted to check that they are not exposed. The globe and cornea should be protected during lid dissection and suture placement. A contact lens corneal protector or lid plate can be used. General anesthesia is more likely to cause adverse systemic effects than local or ocular complications. Ocular problems that do occur are usually not serious and include corneal abrasion, chemical keratitis, hemorrhagic retinopathy, and retinal ischemia (rare). The incidence of corneal abrasion due to general anesthesia is as high as 44%. Simple precautions, such as instilling a bland ointment or taping both pairs of eyelids closed in the case of nonocular surgery and the lids of the nonoperative eye in the case of ocular surgery, may prevent surface trauma produced by the surgical drape, anesthetic mask, or exposure and drying of the cornea. Decreased tear production under general anesthesia, proptosis, and a poor Bell phenomenon may worsen corneal exposure, requiring eyelid suturing in some susceptible patients. The applanation instrument can cause corneal abrasion if the eye or tonometer moves during measurement. In addition, if the disinfectant solution (eg, alcohol) is not removed from the surface of the tonometer, it can cause a circular toxic keratitis where it touches the cornea. The Schiøtz tonometer must be used in the supine position or in the sitting position with the head back far enough to be horizontal. An initial blink or avoidance reaction may occur as the patient sees the tonometer descending toward the eye. The metal plate of the tonometer or the plunger may abrade the cornea. Corneal abrasions are the most common eye injuries and are especially prevalent among people who wear contact lenses. Although corneal abrasions account for about 10% of eye-related emergency visits, the estimated incidence varies by population and depends on how they are defined and the activities involved in the mechanism of injury. A study of eye injuries in a major US automotive corporation found an annual incidence of 15 eye injuries per 1000 employees. Between July 1989 and June 1992, a total of 1983 work-related eye injuries occurred at 33 plants, with 86.7% of cases being superficial foreign bodies and corneal abrasions. The eye injuries comprised 6% of total injuries. One third of eye injuries resulted in the inability of workers to resume normal duties for at least 1 day. In another report, most patients with corneal foreign bodies did not take more than 1 day off work, and up to 30% sought treatment outside of working hours to avoid lost time from work. The incidence of nonpenetrating injuries to the eye, which includes corneal abrasions, is 1.57% per year. Corneal abrasions are common, accounting for 12-13% of new cases seen in 2 different eye emergency units in the United Kingdom. They are also frequent presenting problems in general hospital emergency departments. At a general hospital emergency department in the United Kingdom, 6% of all new cases were eye cases. Trauma accounted for 66% of these cases, or 4% of all cases; corneal abrasions or corneal or conjunctival foreign bodies accounted for 80% of eye trauma cases, or 3% of all cases. Rates of corneal abrasion are equal in all races. More males than females are treated for corneal abrasions. The prognosis is usually excellent, with full recovery of vision if treatment is prompt; however, untreated corneal abrasions can lead to blinding corneal ulcers. Some deep abrasions (eg, those involving the corneal stromal layer) in the central visual axis (ie, the main area of the cornea directly over the pupil) heal but leave a scar. In these instances, a permanent loss of visual acuity may result from corneal cloudiness or irregular corneal astigmatism. Healing of minor abrasions is expected within 24-48 hours. Extensive or deep abrasions may require a week to heal. Recurrent epithelial erosion sometimes occurs days to weeks after a healing of an abrasion caused by shearing injury (eg, from a fingernail, tree branch, or mascara brush). These erosions may be caused by damage to the basement membrane (to which the newly healed overlying cells do not adhere well) and subsequent slough due to mild hypoxia that occurs during sleep. Patients typically are awakened in the early morning by similar symptoms to those of a corneal abrasion. Ophthalmologic follow-up care and observation are indicated. Significant morbidity is uncommon and mostly observed with infectious complications or allergies to medications used for treatment. Patients who are poorly nourished or who have compromised corneas are at particular risk. Close follow-up care is necessary, however, because of the ever-present danger of the abrasion progressing to an ulcer. Essentially all corneal ulcers begin with an abrasion. Corneal abrasions associated with contact lenses can progress to pseudomonal or amebic keratitis and lead to further ocular damage (including perforation or corneal scarring) if not treated promptly. Abrasions involving exposure to vegetable matter are at a high risk for becoming fungal ulcers. Minor injuries may place substantial economic burdens on otherwise healthy people because of time lost from work or school. Foreign body sensation and pain can result in loss of productivity. Mann I. Study of epithelial regeneration in living eye. Br J Ophthalmol. 1944. 28:26. Chen JJ, Tseng SC. Abnormal corneal epithelial wound healing in partial-thickness removal of limbal epithelium. Invest Ophthalmol Vis Sci. 1991 Jul. 32(8):2219-33. [Medline]. Dua HS, Gomes JA, Singh A. Corneal epithelial wound healing. Br J Ophthalmol. 1994 May. 78(5):401-8. [Medline]. Brown L, Takeuchi D, Challoner K. Corneal abrasions associated with pepper spray exposure. Am J Emerg Med. 2000 May. 18(3):271-2. [Medline]. Duma SM, Jernigan MV, Stitzel JD, Herring IP, Crowley JS, Brozoski FT, et al. The effect of frontal air bags on eye injury patterns in automobile crashes. Arch Ophthalmol. 2002 Nov. 120(11):1517-22. [Medline]. Lang J, Rah MJ. Adverse corneal events associated with corneal reshaping: a case series. Eye Contact Lens. 2004 Oct. 30(4):231-3; discussion 242-3. [Medline]. Burke MJ, Sanitato JJ, Vinger PF, Raymond LA, Kulwin DR. Soccerball-induced eye injuries. JAMA. 1983 May 20. 249(19):2682-5. [Medline]. Estwanik JJ, Bergfeld JA, Collins HR, et al. Injuries in interscholastic wrestling. Physician Sportsmed. 1980. 8:111. Powell JW. National Athletic Injury/Illness Reporting System: eye injuries in college wrestling. Int Ophthalmol Clin. 1981 Winter. 21(4):47-58. [Medline]. Lyons JW, Porter RE. Cross-country skiing. A benign sport? JAMA 1978 Jan 23; 239(4): 334-5. [Medline]. Levene R. Major early complications of laser trabeculoplasty. Ophthalmic Surg. 1983 Nov. 14(11):947-53. [Medline]. Harris PM. Bureau of Labor Statistics. Nonfatal occupational injuries involving the eyes, 2002. Available at http://www.bls.gov/opub/cwc/sh20040624ar01p1.htm. Accessed: April 10, 2009. Wong TY, Lincoln A, Tielsch JM, Baker SP. The epidemiology of ocular injury in a major US automobile corporation. Eye (Lond). 1998. 12 ( Pt 5):870-4. [Medline]. Knox KA, McIntee J. Nurse management of corneal abrasion. Br J Nurs. 1995 Apr 27-May 10. 4(8):440-2, 459-60. [Medline]. Quinn SM, Kwartz J. Emergency management of contact lens associated corneal abrasions. Emerg Med J. 2004 Nov. 21(6):755. [Medline]. [Full Text]. Fea A, Bosone A, Rolle T, Grignolo FM. Eye injuries in an Italian urban population: report of 10,620 cases admitted to an eye emergency department in Torino. Graefes Arch Clin Exp Ophthalmol. 2008 Feb. 246(2):175-9. [Medline]. Watson SL, Barker NH. Interventions for recurrent corneal erosions. Cochrane Database Syst Rev. 2007 Oct 17. CD001861. [Medline]. Peyman GA, Rahimy MH, Fernandes ML. Effects of morphine on corneal sensitivity and epithelial wound healing: implications for topical ophthalmic analgesia. Br J Ophthalmol. 1994 Feb. 78(2):138-41. [Medline]. [Full Text]. Trad MJ. Pressure patching indicated in few cases of traumatic corneal abrasions. Primary Care Optometry News 9. September 2004. 36-37. Moller G. [Patching for corneal abrasion. A survey of a Cochrane review]. Ugeskr Laeger. 2007 Sep 24. 169(39):3276-8. [Medline]. Turner A, Rabiu M. Patching for corneal abrasion. Cochrane Database Syst Rev. 2006 Apr 19. (2):CD004764. [Medline]. Goyal R, Shankar J, Fone DL, Hughes DS. Randomised controlled trial of ketorolac in the management of corneal abrasions. Acta Ophthalmol Scand. 2001 Apr. 79(2):177-9. [Medline]. Salz JJ, Reader AL, Schwartz LJ, Van Le K. Treatment of corneal abrasions with soft contact lenses and topical diclofenac. J Refract Corneal Surg. 1994 Nov-Dec. 10(6):640-6. [Medline]. Groden LR, White W. Porcine collagen corneal shield treatment of persistent epithelial defects following penetrating keratoplasty. CLAO J. 1990 Apr-Jun. 16(2):95-7. [Medline]. 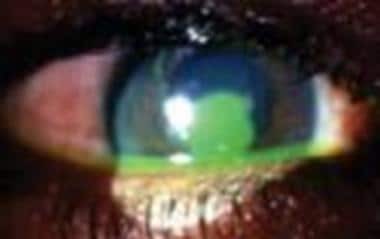 This corneal abrasion appears as a yellow-green area when stained with fluorescein and viewed with a blue light. Corneal foreign body with cobalt blue lighting showing abrasion.